Georgia is a state located in the southeastern United States. It was established in 1732, the last of the original Thirteen Colonies. Named after King George II of Great Britain, Georgia was the fourth state to ratify the United States Constitution, on January 2, 1788. Georgia is the 24th most extensive and the 9th most populous of the 50 United States. 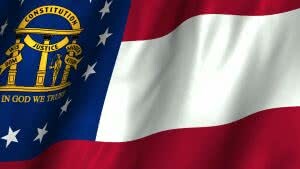 From 2007 to 2008, 14 of Georgia’s counties ranked among the nation’s 100 fastest-growing, second only to Texas. Georgia is known as the Peach State and the Empire State of the South. Atlanta is the state’s capital and its most populous city. Georgia is bordered on the south by Florida; on the east by the Atlantic Ocean and South Carolina; on the west by Alabama; and on the north by Tennessee and North Carolina. The northern part of the state is in the Blue Ridge Mountains, a mountain range in the Appalachian Mountains system. The central piedmont extends from the foothills to the fall line, where the rivers cascade down in elevation to the continental coastal plain of the southern part of the state. The highest point in Georgia is Brasstown Bald, 4,784 feet (1,458 m); the lowest point is the Atlantic Ocean. If you want to incorporate a corporation, Company Express will research the availability of chosen company name, prepare for you and file with the Secretary of State office all required corporate paperwork and obtain certified copy of filed documents, if it will be requested by the client. We also will appoint registered agent for your corporation, as required by the state law, and will help with many of your follow-up corporate needs such as amendment filings, written consents, and annual report preparation and filing. You can find below some of the State incorporation requirements. Name of Georgia corporation must be distinguishable from the name of any existing, reserved or registered corporate names as well as the names of any not-for-profit, LLC, Limited Partnership, professional association or any other entity or forced fictitious name. Company Express will research your company name to make sure it meets Georgia’s standards. Required documents: Articles of Incorporation as well as a Transmittal Information Form. Turnaround time: About 10-15 business days. Expedited filings are available for an additional fee. Follow-up filings: Newly incorporated corporations must file an initial annual registration ($30 fee) within 90 days of incorporation. Minimum number: Corporations are required to have at least one director. Director qualifications: Directors must be at least 18 years old but do not need to be shareholders or residents of Georgia. Corporation’s principal office can be located in or outside of Georgia. Local registered agent is required. Time to file: Corporations must file an annual registration before April 1. The state filing fee is $50. Georgia also has a franchise tax, which is calculated based on the corporation’s paid-in capital. The franchise tax is due on or before the 15th day of the third month following the beginning of the corporation’s taxable period. Turnaround time: About 10 business days. Signatures: A corporation may authorize signatories for annual registrations. Emailed or faxed signatures are accepted. Name of Georgia Limited Liability Company tmust be distinguishable from the name of any other organized entity, fictitious, reserved, registered or corporate name, limited partnership name, professional association name, professional corporation name or limited liability company name. Company Express will research your company name to make sure it meets Georgia’s standards. Required documents: Articles of Organization and a Transmittal of Information Form. Turnaround time: About 8-12 business days. Expedited filings is available for an additional fee. Follow-up filing: Required. An initial annual registration ($30.00 annual fee) must be filed within 90 days of incorporation. Minimum number: At least one managers/members. LLC’s principal office can be be located outside of the state. Local registered agent is required. Time to file: LLCs must file an annual registration before April 1. The state filing fee is $50.